By now you may have seen FDA’s Federal Register Notice, “Prescription Drug-Use-Related Software”, which establishes a docket seeking public input on digital therapeutics. The proposed framework is for discussion purposes only; it is not a draft guidance but a way for FDA to seek input from stakeholders. The document gives insight into how FDA may approach digital therapeutics, specifically the regulation of the software’s output. The comment period for this proposed framework document closes on January 22, 2019. PHSI’s blog has previously discussed how countless new digital therapeutic technologies are being developed. Stakeholders including prescribers, pharmacists, payers, and patients will be impacted by labeling and compendia listings for these products and the myriad of others with drug-use-related software in development. PHSI’s interpretation of the framework is that drug labeling regulations (i.e. the labeling requirements of the Federal Food, Drug, and Cosmetic Act) will apply to the output of the software “disseminated by or on behalf of a drug sponsor for use with one or more of the drug sponsor’s prescription drugs” because it accompanies a specific drug. Software not accompanying a specific drug would not be regulated as labeling, “unless its categorization changes.” If a drug sponsor licenses software that was originally disseminated by an outside company and then disseminates that software for use in conjunction with a specific drug, it would not be regulated as labeling. While the output of the prescription drug-use related software is the focus of the proposed framework, it notes that the software itself is the “responsibility of the drug sponsor to ensure the reliability” of the software. FDA points out that the function of the software could impact the output, which is considered promotional labeling. The compendia companies publish information provided by manufacturers as well as FDA when adding a new product to their databases. Information gleaned from the FDA-required labeling is an important component of their processes. Each compendium may approach digital therapeutics differently. The proposed framework document in the Federal Register specifically mentions Abilify MyCite®. PHSI expects that other examples may include inhalers, such as the newly approved ProAir Digihaler, and injection devices that contain sensors, modules, and/or apps. Using Abilify MyCite as an example, one compendium appears to differentiate the listing from products with the same active ingredient by using the dosage form field. The FDA approved dosage form for the product is “tablet with sensor.” Another compendium identified the difference in the product name field only while keeping the same dosage form as existing Abilify tablets. These differences could impact reimbursement of the product at the pharmacy. Another digital therapeutics example is Sandoz and Pear Therapeutics jointly-developed app called “ReSET-O” that is cleared by the FDA via a 510(k) and is categorized as a Class II device. “ReSET” was listed in the Elsevier Gold Standard compendium earlier in 2018 and is now listed in the Red Book as deactivated; as of this writing, it has not been listed in Medi-Span’s PriceRx, First Databank/Analysource, or Cerner Multum. As additional products that combine a drug and prescription drug-use-related software are introduced, the strategies used to identify the products will continue to evolve. Compendia, manufacturers, and healthcare professionals will want to be familiar with the FDA’s proposed framework and the potential implications for all stakeholders. Current listings should be reviewed for potential negative impact on digital therapeutics reimbursement to prevent pull through issues during the launch process. PHSI can assist manufacturers with this review and strategic planning to prevent launch challenges. If you would like to submit comments to FDA regarding the proposed framework, more information on how to do so is available in the Federal Register notice: https://www.federalregister.gov/documents/2018/11/20/2018-25206/prescription-drug-use-related-software-establishment-of-a-public-docket-request-for-comments. For more information on integrating digital therapeutics products into the compendia, contact PHSI. PHSI has been following the discount generic program landscape for over a decade. Over the past few years, $4 generic lists have slowly melted away into the shadows of retail pharmacy. There are no longer banners hanging from store fronts promoting these programs or prominent displays appearing on retail pharmacy websites. Specifically, PHSI has analyzed the number of product offerings on discount generic lists in 2015 and again in 2018. Several retail pharmacies, including CVS and Giant Eagle, have stopped offering $4 lists altogether. For chains that have discontinued the $4 lists, cash-paying patients may now see their prescriptions being charged at the minimum prescription cash price. Knowing all of this, it is surprising to see the launch of Kroger’s Rx Savings Club. 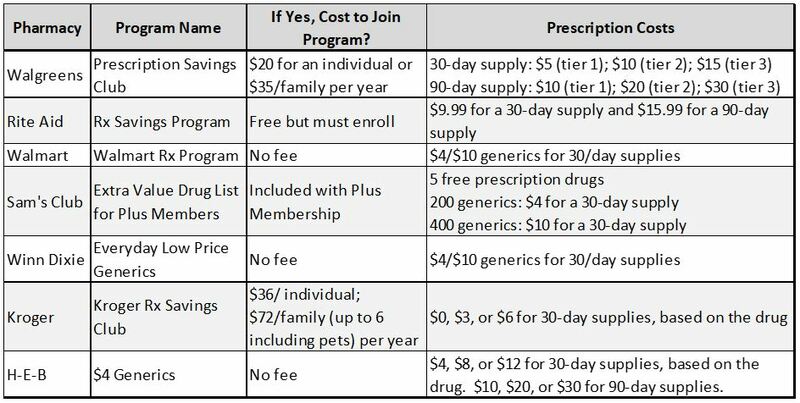 The Kroger Rx Savings program is a new paid program ($36/individual and $72/family of up to six) that offers three tiers of low-cost medications. The first tier will include free generic medications, including sertraline, amlodipine, metformin IR, and montelukast. Tiers two and three will respectively offer $3 and $6 30-day supplies. Kroger has partnered with GoodRx to develop the program. PHSI expects that the generic medications included in the Kroger Rx Savings program will offer additional discounts above those seen on the GoodRx website. Although other chain pharmacies are not overtly advertising their discount generic programs, a review of their websites shows these programs still exist. An overview of the major retailer generic discount programs is shown in the chart below. Like the Kroger program, Walgreens discount program is a paid program that offers three tiers of generic medications. As PHSI has mentioned in past newsletter articles, pharmacy chains have not been increasing the medications offered on their discount generic lists. The Kroger Rx Savings Club may tout the inclusion of the popular (and somewhat new) generic atorvastatin, but, in general, the number of medications offered on discount generic lists has decreased. Perhaps with the costlier membership fee, the Kroger program will have expanded drug offerings. With high deductible health plans becoming more common, we may see renewed interest in discount generic programs, a la $4 lists. Based on recent headlines, retailers are finding other ways to deliver value and entice customers to their stores. Walmart recently revealed a deal with Express Scripts to launch InsideRx. Inside Rx will provide uninsured patients with discounts on brand-name drugs, with Express Scripts estimating an average savings of 40%. 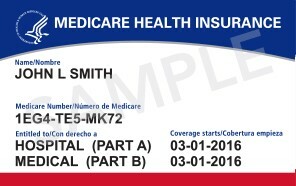 The PBM CVS Caremark also announced their new digital prescription savings card, Sharecare, which will help uninsured or underinsured patients. The Sharecare App offers discounts within the CVS Caremark national pharmacy network, which includes not only CVS pharmacies, but Walmart, Rite Aid, and Walgreens stores. With the plethora of options available, there is more competition than ever for the cash-paying patients. PHSI will continue to monitor and report on these evolving retail pharmacy strategies. CVS Health, Express Scripts (ESI), and Optum Rx have published their formulary exclusion lists for 2019. When comparing the number of new exclusions, PHSI has found slight variances between what PBMs announce, what outside entities report, and what PHSI research uncovers. Numbers can vary based on whether multiple formulations of the same drug are counted as one or multiple additions (e.g. Vanatol S vs. Vanatol LQ). While PHSI includes newly-excluded multi-source brands (brands that now have generics available), other reporting entities exclude these drugs from their totals. With that disclaimer stated, PHSI has completed its annual analysis of the formulary exclusion lists. PHSI calculates that ESI added an additional 59 items to their exclusion list, including both single-source and multi-source brands. In an August Twitter post, CVS Health reported removing 23 drugs from the standard formulary for 2019, while other sources reported 26 removals. 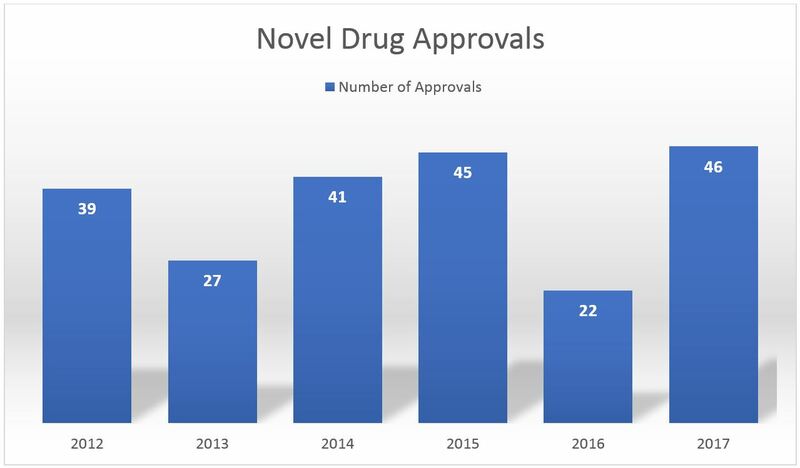 When PHSI reviewed the January 2018 vs. January 2019 formulary drug removals, we noted 37 new exclusions. Optum Rx will exclude 50 additional drugs in 2019. The new 2019 exclusions, as researched by PHSI, are as follows. There are some interesting exclusions in the HIV and Hepatitis C treatments, such as Atripla for HIV (excluded by Express Scripts and Optum) and Mavyret for Hep C (excluded by CVS and Express Scripts). There are new exclusions in hemophilia (Factor VIII products) as well, with Express Scripts excluding Eloctate, Recombinate, and Xyntha. 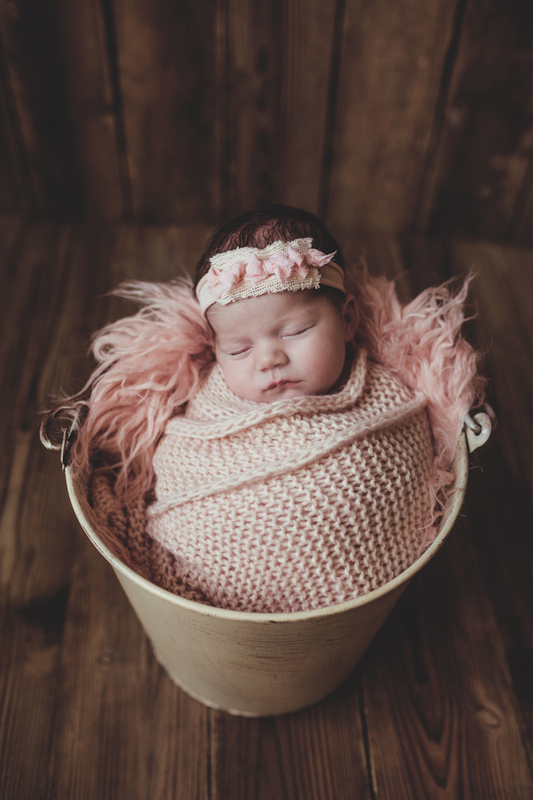 The PBMs also note other specialty product exclusions, such as the injectable Hyalgan (CVS), Saizen (Optum and CVS), and Berinert (ESI), as well as some fertility drugs. PBMs also appear to be focusing on more cost-effective pain management therapies and some have excluded Lazanda and Sprix. The introduction of Viagra generics in 2018 continues to shift coverage to lower cost products. In addition to the usual exclusions of brand products that have generic versions available, Stendra is now excluded on CVS and Optum lists (not mentioned on Express Scripts). New for 2019 – PHSI has also analyzed Optum’s exclusion list. [iii] While PHSI did not analyze Optum’s list in past years, PHSI notes that this list contains some updates from previous versions, including the addition of some new products such as Admelog and Sprix. The major PBMs have taken different approaches to managing drug spend in 2019, but formulary exclusions in general continue to play a large role in that management. This article represents PHSI’s analysis of publicly available information regarding these three PBMs’ formulary exclusion lists for 2019; readers are encouraged to assess the lists themselves. Links to the exclusion list source information are provided below. [i] Available https://www.managedhealthcareconnect.com/content/express-scripts-covers-amgen-lilly-migraine-therapies-excludes-teva-drug?hmpid=bWtyYXVzZUBwaHNpcnguY29t. Accessed October 23, 2018. [ii] Express Scripts 2019 National Preferred Formulary Exclusions. 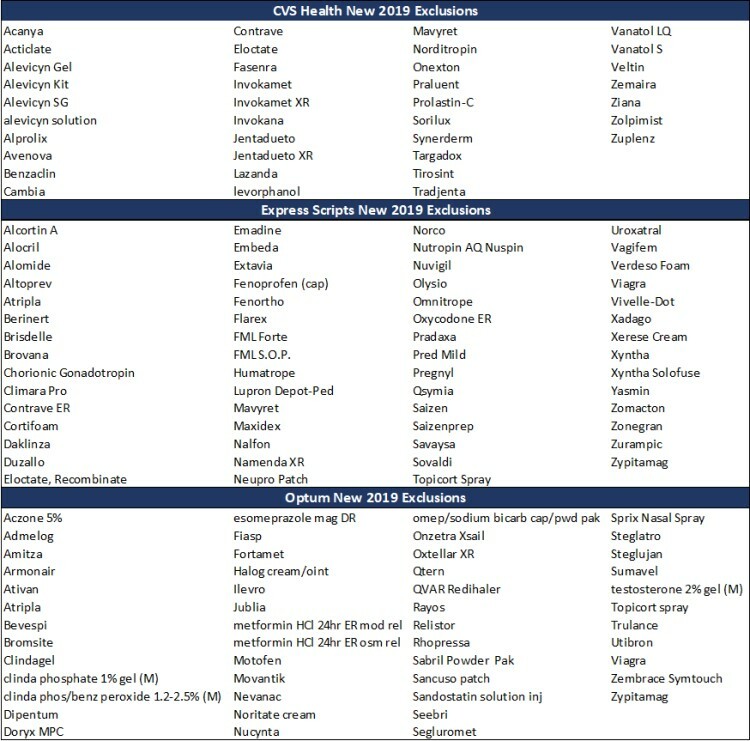 Available https://www.express-scripts.com/art/pdf/Preferred_Drug_List_Exclusions2019.pdf. Accessed October 23, 2018. 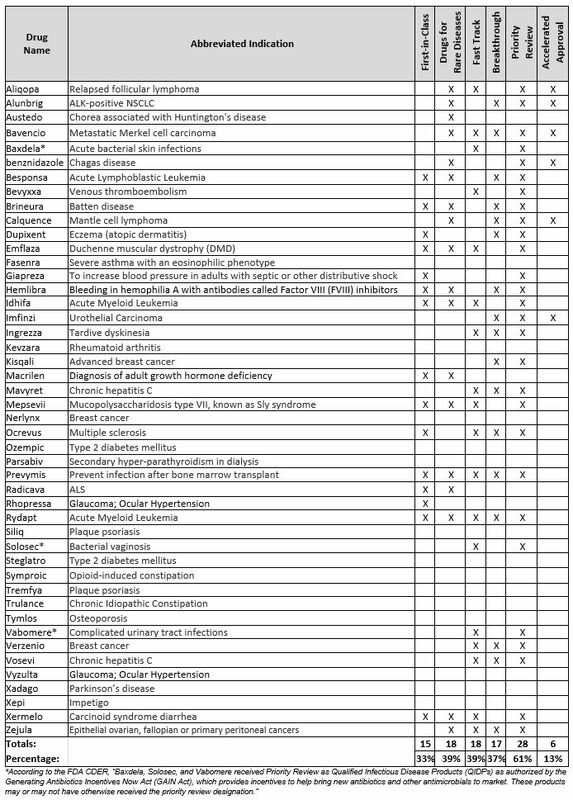 [iii] Optum January 1, 2019 Premium Formulary Exclusion List. https://hr.nd.edu/assets/291074/optumrx_premium_formulary_exclusions_jan.._1_2019_finalv4.pdf. Accessed October 23, 2018.